The Denver Broncos are the NFL’s first team facing a quarterback competition this preseason to make a decision. Two preseason games were all incumbent Trevor Siemian needed to retain his starting job over Paxton Lynch. Anyone who watched Denver’s preseason game against the 49ers over the weekend would have seen the announcement as inevitable. But on Monday, Broncos head coach Vance Joseph made it official. Lynch got a fair shake after starting Denver’s game in San Francisco over the weekend. In fact, those who observed joint practices between the Broncos and 49ers during the week believed that Lynch had taken a step forward and was beginning to pose a serious threat to Siemian. However, he failed to show that during Saturday’s game. Lynch, a former first round pick, completed 9 of 13 passes against the 49ers for just 39 yards. He also picked up positive yards with his feet. But he did not do enough to push Siemian out of the starting job. To be fair, Siemian didn’t do all that much to stand out either. But he was solid and consistent, completing 8 of 11 passes for 93 yards, including a nice back shoulder touchdown throw to Jordan Taylor. Following Saturday’s game, Siemian was confident that he had done enough to win the starting job. After all, he beat out both Lynch and Mark Sanchez for the job this time last year. However, the Broncos have a whole new coaching staff this season under Joseph, forcing him to impress a new set of eyes. With Siemian under center, the Broncos have a quarterback who isn’t overly flashy but who they know will be steady. 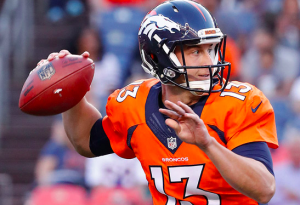 Siemian was 8-6 as a starter last season, throwing for over 3,400 yards with 18 touchdowns and 10 interceptions. With Denver’s vaunted defense, the Broncos may be able to get by with a game manager like Siemian running the offense. Meanwhile, Joseph remains high on Lynch’s future despite him coming up short in the quarterback competition two years in a row. He’s also comfortable if Lynch has to come into a game in relief of Siemian this season. As Joseph mentions, Lynch has great arm talent and still has a much higher ceiling than Siemian. However, with the Broncos possessing one of the NFL’s best defenses, going with a more polished and proven quarterback like Siemian makes sense. The Broncos believe that they are Super Bowl contenders this season, and so naming Siemian the starting quarterback is the right decision.